Hillary Clinton is expected to announce her pick for vice presidential candidate tomorrow and smart money is on Virginia Senator Tim Kaine. The progressive base of the Democratic Party is not happy about this and is already complaining. 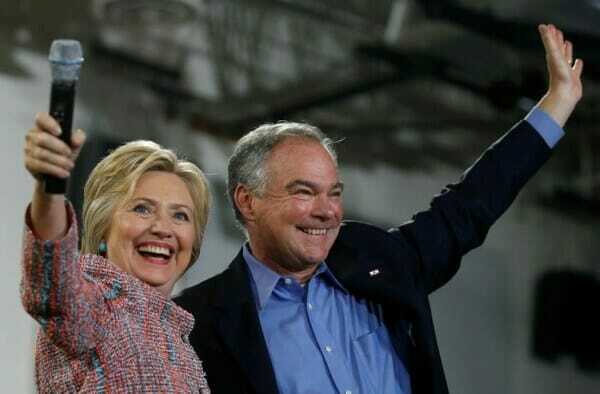 Top liberals on Thursday warned Hillary Clinton not to pick Sen. Tim Kaine as her vice presidential nominee, arguing that the Virginia Democrat’s positions on Wall Street and trade represent a betrayal of progressive values and could doom the party’s ticket in the fall. Mrs. Clinton is set to announce her No. 2 pick over the next 48 hours, and Mr. Kaine — who previously served as the governor of Virginia — reportedly is at the top of the list. But the senator has angered progressives for, among other things, his outspoken support for the Obama administration-backed TransPacific Partnership, a proposed trade deal that liberals, including Mrs. Clinton and Sen. Bernard Sanders, oppose. Mr. Kaine this week also signed on to a bipartisan letter calling for certain sections of the landmark Dodd-Frank financial regulation bill to be undone. Fourteen other Democratic senators also signed the letter. Those two positions have led progressives to sound the alarm as Mrs. Clinton nears her decision. It’s funny that they don’t like Kaine because of his positions on Wall Street. Have they looked at their presidential candidate lately?